At all times, but especially when sad and difficult things happen in our lives and the lives of others we know and/or hear about, it is essential for us to cling to the promises of God. We must hold tightly to what we know is true - even when we may not understand. 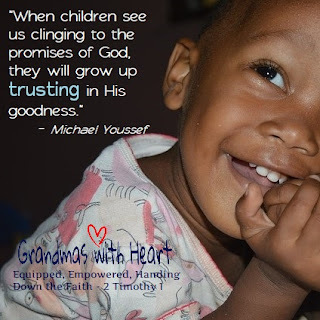 When our grandchildren see us doing these things, they will be able to grow up trusting God is good; in the times where they are happy and rejoicing and the times when they are confused and sad. Hold tightly to God and His promises and show what it looks like to trust God. Not empty or meaningless platitudes; but instead the truth and what we must do.